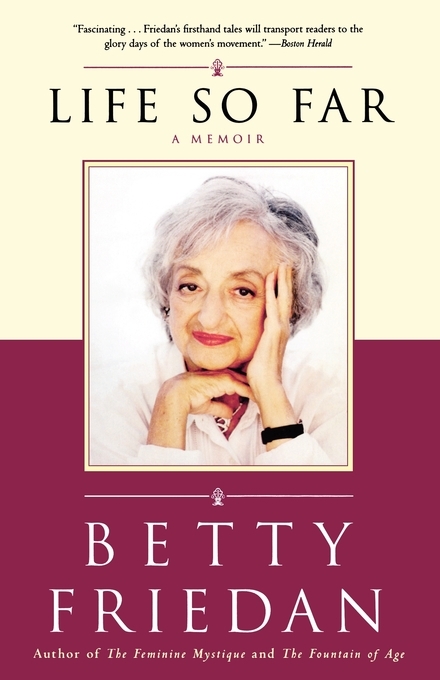 It was Betty Freidan herself, in Life So Far, who spoke about her life and career and told us what it was all like from the inside. With the unsparing frankness that made The Feminine Mystique one of the most influential books of the century, Friedan looked back and told us what it took, and what it cost, to change the world. She took us on an intimate journey through her life, from her lonely childhood to the founding of NOW and her brilliant, contentious, and brave leadership of the Movement. Life So Far chronicles the secret underground of women in Washington in the early sixties who drafted Friedan to spearhead an "NAACP" for women, and the daring of many who spoke out against discrimination. Friedan recounts the political infighting and dirty tricks that occurred within the Movement as well as the forces that tried to destroy it and how hard she fought to keep the Movement practical and free of extremism, including "man-hating." Friedan is equally frank about her twenty-two-year marriage to an advertising entrepreneur, which deteriorated into physical abuse. They later reconciled as friends. Life So Far is forthright, full of stories and larger-than-life characters, and it is the scope of Friedan's vision and achievements that makes her memoir so important and compelling. A founder of NOW and a vanguard leader of the Women's Movement, Betty Friedan was the author of The Feminine Mystique, It Changed My Life, The Second Stage, Beyond Gender, and The Fountain of Age. She taught at Northwestern University, Yale, Temple, Harvard, and USC. She died in 2006. "Fascinating...Friedan's firsthand tales will transport readers to the glory days of the women's movement." "[Friedan] takes us behind her public façade to a woman who began her remarkable adult life as 'just a housewife,' who wrote a book...that reaped the whirlwind, and found herself contending...with the awesome responsibilities and contradictions that the book thrust upon her.... An immensely touching, beguiling and engaging book."